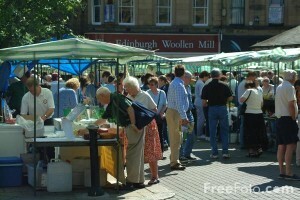 Hexham Farmers’s Market is a twice monthly farmers’s market based in the historic market town of Hexham in Northumberland. Our aim is to offer our customers a wide range of fresh, locally produced artisan breads of a high quality and at a fair price. We encourage our producers to use ingredients that have been grown or reared within the region too. You will usually find somewhere about 20 stalls selling a wide range of meats, vegetables, breads and pies, soups, jams and pickles, cakes and cordials and many other products. All our products are produced within 50 miles of Hexham and you will always find someone on the stall who can tell you about the product they’re selling. After all, they are the producers of the foods and are passionate about what they do. Morpeth Farmers’ Markets are held on the Market Place on the first Saturday of each month running from 9am – 3pm. There is no farmers’ market in January, so the first farmers’ market of 2019 will be Saturday 2nd February Morpeth Market is managed by Northumberland County Council and Sanderson Arcade, working in partnership with Morpeth Town Council, Morpeth and District Chamber of Trade and other local organisations through the Morpeth market working group. Although farmers’ markets are not restricted to farmers, traders must: Be local – and in Morpeth, we count that as being from up to 50 miles away Only sell their own produce, and Must be involved in the actual production of what they are selling Several traders are members of the Produced in Northumberland scheme – look out for the identifying badges.